March / Sunnyside / Parades in Queens / Queens Buzz. I attended the St Pat's For All Parade in Sunnyside on Sunday. I came very, very late for the speeches, but one of the announcements made was that the Mayor will be marching in the annual St. Patrick's Day Parade in Manhattan on March 17th as the dispute regarding LGBT marchers has ended. The Sunnyside / Woodside St. Pat's For All Parade began in protest to the ban of LGBT Irish to fully participate [free expression / come out] in the parade. Conservative Catholics, including the Conservative Irish, believe it's against the Christian Church teachings to permit / tolerate LGBT behavior, based on interpretations of Biblical teachings. The Bible is a collection of religious writings created about 2,000 years ago, the first half of which includes stories handed down through oral traditions dating back centuries prior to the time of Christ - if not longer. 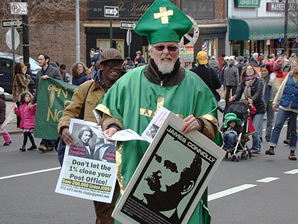 Hence the Irish in charge of the St. Pat's Parade in Manhattan embraced the Conservative Catholic point of view, and up until this year, banned LGBT people from full participation in the parade. In 2015 Manhattan St Pat's Day Parade sponsors, including Guinness which is a not only an Irish beer-like drink, but also a defacto Irish institution - pulled out of the parade in protest of the LGBT ban. Just one year earlier, in 2014, Mayor de Blasio declined an invitation to march in the parade because of the LGBT ban. 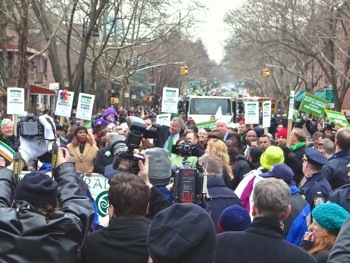 In 2013, in spite of the LGBT ban, Mayor Bloomberg continued the mayoral practice of marching in the Manhattan St Patrick's Day Parade. “If someone is gay and he searches for the Lord and has good will, who am I to judge?” "
We researched the LGBT topic back in 2010 and posted this report regarding the science and history of gay rights in NYC. We may not all be Irish, but we are all Americans. So this year I video recorded the parade, with a focus on the musical, dance & cultural performances by the groups participating in the parade. The recording includes a number of bagpipers, the names of which I didn't catch because they don't really market their names, the Brian Fleming Band playing fiddling Irish music, the McManus Irish Dance Company practicing a little marching number while they were waiting, but it's best done while marching which you'll see after the parade resumed moving, the Rude Mechanical Orchestra playing a jazzy tune and PS123 Sapphire Dance Line & the Marching Cobras from Harlem doing a great dance and music routine. 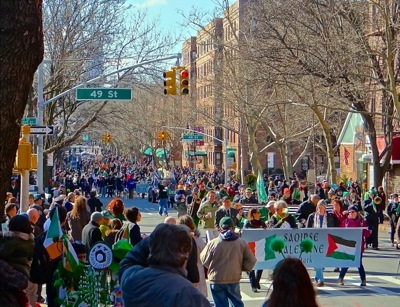 I cannot think of a better place for an Irish-hosted, multi-cultural parade than Queens, which may be what the St Pat's For All begins to evolve into, having successfully protested the former, excusionary practices of the St Patrick's Day Parade in Manhattan. Click here to watch the St Pat's For All Parade 2016 Sunnyside Queens video. Happy St Patrick's month. The photo above shows the speakers on the podium [front row left to right] which include Public Advocate Letitia James, NYS Comptroller Thomas DiNapoli, CCM Daniel Dromm, NYC Council Speaker Melissa Mark-Viverito, Brendan Faye, a parade co-Founder [back turned to us], and to the far right Kathleen Walsh D'Arcy also one of the parade co-Founders of the event. Behind them you can find [but you have to look hard / left to right] NYC Comptroller Scott Stringer, CCM Jimmy Van Bramer, Congressman Crowley and NYC Mayor de Blasio. 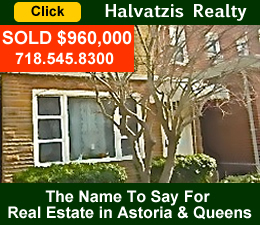 March 2, 2015 / Sunnyside / Ethnic Culture In Queens / Queens Buzz. 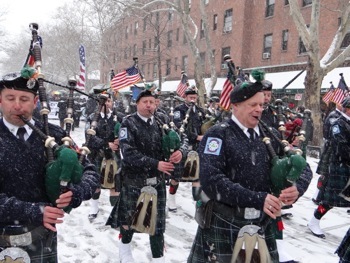 A bit of snow was falling, and temperatures were just below freezing, as I made my way down to the 16th annual St. Patrick's Day Parade in Sunnyside. To add to the challenges on this day, the #7 subway line was out between Times Square in Manhattan and 74th Street / Broadway in Jackson Heights. It was no surprise that the streets were fairly empty, and there was only a small gathering down near the podium at 46th Street on Skillman Avenue. The event was to begin at 1 pm, but that didn't happen today. Folks were milling about, so I started mingling. The first Miss Queens  of the Miss America pageant had arrived and posed wearing her tiara along the snowy walks along Sunnyside Gardens. Her name is Catherine Manett who is originally from Patchogue on Long Island and more recently of Whitestone in Queens. She will be competing in the Miss America New York pageant on Staten Island on June 6th - and if successful there - will go on to the Miss America finals in Atlantic City in September. Given the cold temperatures and snow, it didn't seem to be a great day for a run. But that didn't stop several members of the intrepid WoodsideSunnysideRunners.com club. I found Paz Tanjuaquio, one of the Founders of Topaz Arts in Woodside, dressed in her running suit conversing with Woodside Sunnyside Runners club Founder Jay Radner and a third runner. They were resting after a short run up and down an empty Skillman Avenue and decided to enjoy the fine weather by staying to hear the speeches and view the parade. Jay told me that there are about 1,000 runners on his email list and that they do a run nearly every day. You can learn more about the club on their website www.woodsidesunnysiderunners.com. Slan. Click here for Irish pubs / bars in Manhattan on St. Patricks Day 2015. 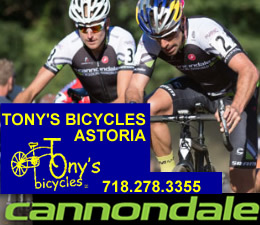 March 2, 2014 / Ethnic Culture in Queens / Sunnyside & Woodside / Queens Buzz. I attended the St Pat’s For All Parade in Queens on Sunday afternoon. It was an overcast day, with temperatures in the 30’s. Speeches and an Irish cultural celebration began at 1 pm, followed by the parade which was to begin at 2 pm, but didn't get going until about 2.45 pm. This year I skipped most of the pre-parade show and, like many in the crowd, awaited the presence of Mayor Bill de Blasio. De Blasio is the first Mayor of NYC to politely decline to march in the Manhattan St Patrick's Day Parade because it bans gays from marching in it. The Mayor's presence included an increase in the presence of NYC elected officials who attended the parade. This included the new Queens Borough President, Melinda Katz, which is worth noting since it's the first time a Queens Borough President has attended this parade since I began covering it in 2008. Click here to read our report about and view photos of the St Pat’s Parade in Queens, including a photo slide show. 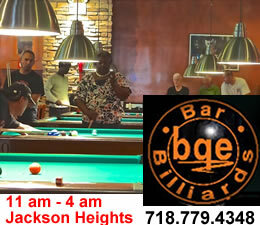 March 5, 2013 / Ethnic Culture in Queens / Sunnyside & Woodside / Queens Buzz. I attended the St Pat’s For All Parade in Queens on Sunday afternoon. It was a crisp Spring day, with temperatures in the 40’s, and even warmer in the ample sunshine. They had scheduled an Irish cultural celebration to begin at 12.30 pm, followed by the parade which was to begin at 2 pm. The celebration included a number of Irish dances performed by Niall O’Leary’s School of Irish Dance and Caroline Duggan and the Keltic Dreams of PS 59 in the Bronx [see photo]. There were also musical performances by several groups, including the Brian Fleming Band which has been a regular performer at the St Pat’s For All Parade for years. And of course there were speeches ... click here to read the rest of our report about, and view our photos of the St Pat’s Parade in Queens, including a photo slide show. March 5, 2012 / Sunnyside & Woodside / Ethnic & Religious Culture / Queens Buzz. 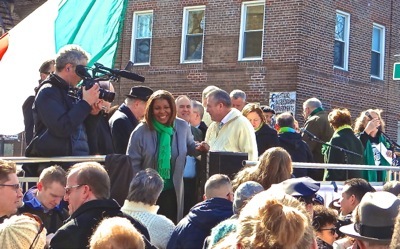 It was a beautiful March day, with temperatures in the 40's, as I made my way down to hear the speeches and watch the St. Patrick's Day Parade in Sunnyside and Woodside. Last year they moved the parade gathering area up a few blocks from 43rd Street to 47th Street. The new location seems to provide a more communal gathering spot than in the middle of one of Sunnyside's busy intersections. I was amazed at the turn out of potential NYC mayoral candidates. NYC Public Advocate Bill Di Blasio, Manhattan Borough President Scott Stringer, NYC Comptroller John Liu were all in attendance. 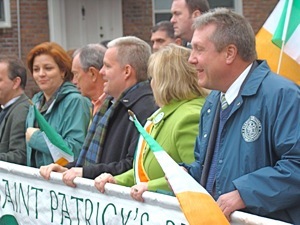 Notably absent was St Pat's For All Parade regular, City Council Speaker, Christine Quinn. After the parade we contacted her office to inquire why she was absent and were informed that she wasn't feeling well. Click here to read more about our report on the St Pat's For All Parade in Sunnyside & Woodside Queens. The report includes a slide show with photos of the speakers, warm up performances and parade. March 1, 2012 / Sunnyside & Woodside / Ethnic & Religious Culture / Queens Buzz. This weekend on March 4th, the St Pat's For All - St Patricks Day Parade, marches through Sunnyside and Woodside. The festivities begin at 1 pm, with speeches by an Irish novelist and historian as well as by city government officials. The parade begins at 2 pm. The parade route has been modified. 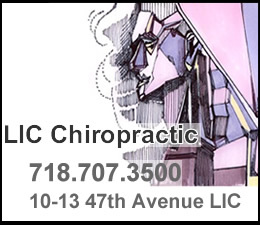 The festivities will be held at 47th Street and Skillman Avenue and the parade marches uphill into Woodside to 58th Street. Click here to view a map of the St Pats For All Parade route. Check back here on Monday March 5th for photos and a report about the St Pats For All parade in Sunnyside / Woodside Queens. Sunnyside / February 24, 2013. It's less than a week away, it tis. 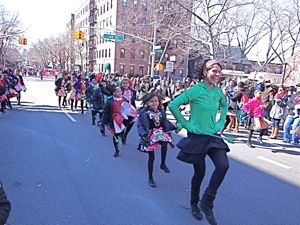 The annual St Pat's Parade festivities begin in Sunnyside on Sunday March 3rd at 12.30 pm on Skillman Avenue at 47th Street. 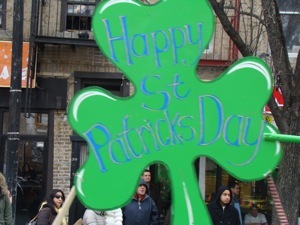 The St Pat's Parade begins at 2 pm and the St Patrick's Day Parade ends in Woodside at 58th Street at about 3 pm. The St Patrick's Day Parade festivities begin at 12.30 pm, and the parade begins at 2 pm at 47th and Skillman Avenue in Sunnyside. In 2010 we photographed Irish Step Dancers, a traditional Irish band, and the bag pipers. There were other acts too. Click here to view a map showing the route / map of the St Patrick's Day Parade in Sunnyside & Woodside. March 7, 2011 / Sunnyside & Woodside / Queens Buzz. The St. Pat's For All Parade in Sunnyside marched up Skillman Avenue to Woodside in spite of a persistent rain and overcast skies. The event was headlined by the Mayor, the City Council Speaker, two city councilmen, a former police chief and a couple of guests from Ireland. Of note was Christine Quinn's impassioned speech about eliminating discrimination. This speech was in response to a decision by the St. Patrick's Day Parade organizers in Staten Island to prohibit gays from marching in their parade. A similar decision was made about ten years ago by the Manhattan St. Patrick's Day parade organizers. The St. Pat's For All Parade in Sunnyside & Woodside does not prohibit gays from marching in its parade. Given the inclement weather and shortened parade route [all parade routes have been shortened by 25% this year], there appeared to be far fewer parade watchers, but that didn't seem to dampen anyone's spirits [pun intended]. Shortly after the parade ended a great downpour came, telling us all that the parade was over. I guess our Irish guests brought along a bit of weather from the old country. Click here to view a slide show of St Patrick's Day Parade photos 2011 in Sunnyside, Woodside & Queens. Sunnyside / March 8, 2010. By all accounts the St Pat's Day Parade in Sunnyside and Woodside was a big success. We estimate that on this fine day the audience count was easily in the thousands [two to three thousand is our estimate]. This was significantly up verus last year, quite possibly due to the nice sunny weather which included temperatures in the fifties, although there was a cool breeze. 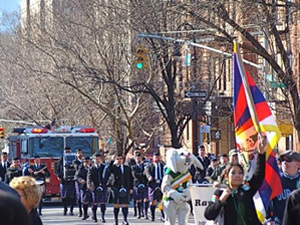 The St Pat's For All Parade in Sunnyside and Woodside has been in existence for eleven years now. It's interesting to note that the parade legacy only goes back little more than a decade, given that Sunnyside and Woodside were considered the Irish sections of Queens for the better part of the last century. The parade began out of a controversy in the late nineties. 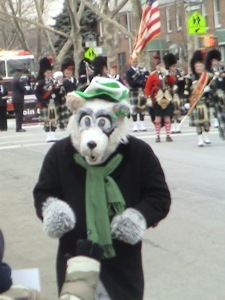 The Manhattan St Pat's Day Parade forbid non-heterosexuals to march in their New York City parade. 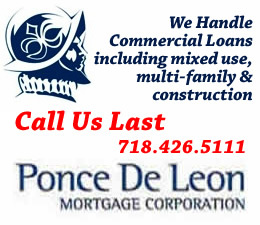 Click here to read the rest of this story including a slide show and a link to our album which contains many photos of the St Pat's Day Parade 2010 in Sunnyside and Woodside. Sunnyside & Woodside Queens NY / March 2008 and March 2009. 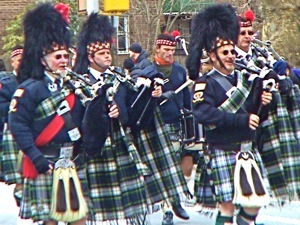 Every first Sunday in March, the St Patrick's Day parade traverses Sunnyside and Woodside. These two neighborhoods, once the home to a large concentration of Irish immigrants [and still many today], has grown to become one of the more ethnically mixed sections of metro New York City. Hence when the Manhattan St Patrick's Day parade banned gays from marching in their parade, the Sunnyside / Woodside St Patrick's Day Parade filled in the breach by opening the parade to gays and anyone else who wished to join in celebrating Irish culture. The following are brief reports of the parade the past two years including a photo slide show. Click here to view our report on the St Patrick's Day Parade in Sunnyside & Woodside Queens. January 16, 2018 / Sunnyside & Woodside / Queens Buzz. Click here for the time, festivities, route map and history of the St Pats For All Parade in Queens neighborhoods of Woodside and Sunnyside. The 2014 St Pat's For All Parade in Queens starts at 2 pm, but is preceded by festivities that begin at 1 pm. The St Pat's Parade begins at Skillman Avenue at 47th Street and runs up the hill to Skillman Avenue at 58th Street. There are many Irish Pubs and other ethnic restaurants and bars in the neighborhood which will be locales of celebrations to follow. 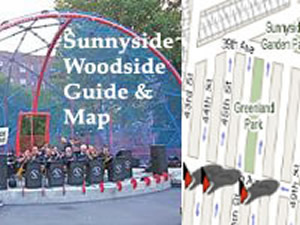 Click to view three maps of Sunnyside & Woodside: 1) map of some of the shops In Sunnyside & Woodside with links to home pages or stories on this site, 2) map of some of the restaurants with links to home pages or stories on this site, and 3 map of cultural attractions in Sunnyside & Woodside most for which there are reports about them to be found on this site. 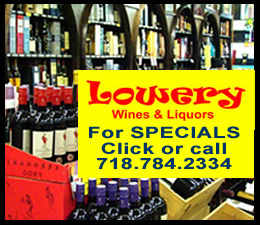 Click here to view Sunnyside & Woodside Maps - Shops, Restaurants and Cultural Attractions in Sunnyside & Woodside Queens. It is also a map of things to do in Sunnyside & Woodside Queens. 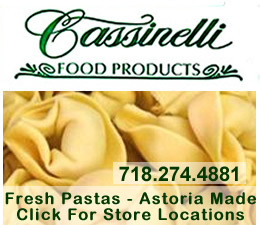 Click on these advertisements for promotions, discounts and coupons by retailers and restaurateurs in Woodside, Sunnyside and nearby Queens. 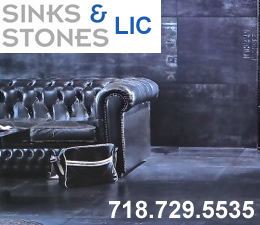 Click this link to search for something in our Queens Business Directory. Also check out Taste of Sunnyside.